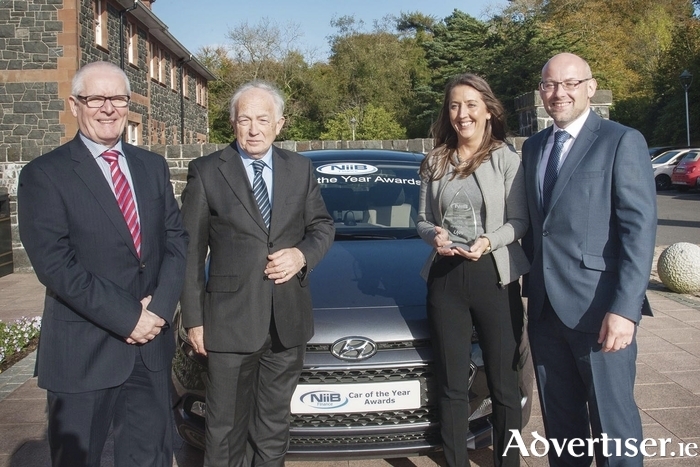 Pictured (L-R) at the presentation of the Northern Ireland Car of the Year 2016 were Terry McLean, regional manager Hyundai UK; Jim McCauley, chairman Ulster Motor Writers' Association; Natasha Waddington, head of press and PR, Hyundai UK; and James Dempster, regional manager NIIB Finance. Jim McCauley, chairman of the Ulster Motoring Writers' Association, said the i20 had immediate appeal in terms of its sophisticated styling and high quality interior. "The admiration continues as you take to the road with its stable and secure handling and an excellent choice of engines. “The initial fear was that Hyundai had priced itself out of the market with this car, considering the contrasting interior finish, soft touch materials and the high level of standard specification in SE trim, including safety elements. But the final surprise was the very competitive price for an overall quality package that represents excellent value for money, underwritten by a five-year warranty." The awards are sponsored by NIIB Finance, part of the Bank of Ireland. NIIB's regional manager James Dempster presented the awards, saying: "With NIIB Finance being the leading independent funding provider to the Northern Ireland motor market, I am delighted to have teamed up with the Ulster Motoring Writers' Association, delivering the 2016 NIIB Northern Ireland Car of the Year Awards." Other category winners at the awards ceremony included the Mazda2 (Small Car category ), Seat Leon (Family Car ), Suzuki Vitara (Lifestyle SUV ), Audi RS3 (Sports Performance ) and the Mazda6 Tourer won the Executive Car of the Year.